Yes that original cover is as bad as you think it is, no it isn’t indicative of the quality of the story. Second one…not much (any) better. This blog post has been sitting in my drafts since December 2015, and I couldn’t have been more thrilled to get an ARC of this book from the Publisher, via Edelweiss, through Tasty Book Tours (this does not affect my opinion of this book or the content of my review and the usual disclaimer when it comes to Andrews applies…I bought it anyway). Oh Nevada and Mad Rogan, how do I adore thee? I’ll admit Burn for Me was a little rough at first when it came to my preferences. 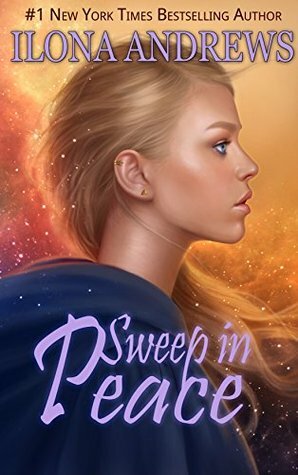 It isn’t so much paranormal romance (abysmal covers notwithstanding) as it is urban fantasy that you can tell will eventually have a stronger romantic component. And the hero was fairly anti at the time. But sometimes an epilogue just smacks you upside the head and shakes up all your preconceived notions about a character. So I knew I’d have to read the next one. Of course with the long wait time, I found myself going back to the first book. And much like the first Kate Daniels book, this is one that seriously improves with re-reading. It went from a 3.5 basically saved by the epilogue that bumped it to 4.5, to one of my all time favorite books. We got a glimpses of the secrets hidden in Nevada Baylor in the first book, but this one blows those secrets wide open, and I LOVED it. It wasn’t like she was hiding it from herself, so much as that in the struggle for the day-to-day you don’t always have the chance to utilize your best self, if you see what I mean. But then BAM! you get that incident where you have to reach down and pull your best self out, that is where the magic happens and it was GLORIOUS! Nevada as a heroine rocks. But as much as I adored Nevada, honestly (excepting her taste in men…initially) I adored her in the first book too. This second book really shone the light on Rogan, and it took facts we already knew about him, and then reframed them in a light that let us know, or maybe understand, Rogan better. Absolutely heartbreaking and heart wrenching, things that were pointed out gave me a filter to kind of take objectionable characteristics he exhibited, and overlay them with the understanding I have developed for the people I have in my life who have gone through similar situations. PTSD is a hell of a thing. That is Ilona Andrews gift, giving us the humanity in these powerful…sometimes kind of insane alpha-hole characters. And the relationship that built between these two strong people was fantastic, and funny, and a little sad all at the same time. Instead of a one note, one hit kind of resolution, it was messy just like life. And thankfully, we had enough will they/won’t they in the last book, so all that simmering heat just burst right onto the pages in this book. Very hot. And putting it all together created a very credible relationship that left me feeling warm…like super warm. But I definitely enjoyed the ride. The story itself was action packed, and aggressive, and twisty-turny enough to keep me engaged through out. Wheels within wheels conspiracies are slowly being brought to the forefront and I have a bamboozled on that one. Plus there was a ton of zany, crazy sauce Baylor family drama, which was a definite plus to me because the family dynamics were and continue to be a major selling point for this series. And man do family dynamics (not just Nevada’s) play an important role in this series-the good and the bad. Few things irk me so much as a romantic couple that seems to live in a vacuum, bereft of other family, friends, and human contact. But this book is cause for rejoicing on that front. The secondary characters in this story are fleshed out and appealing and there are a host of them I’d be thrilled to see get their own stories. Do I want Bug, Cornelius, Leon, and Bernard to get their own features? Yes, yes I most certainly do! The story arc for this book had a highly satisfying resolution (for a blood thirsty and vengeful girl like me you really can’t get much better than the ending this book’s big bad got at the hands of the person most wronged), and the overall series arc progressed enough that I am champing at the bit for the next book…but not so much that I feel I have any true inkling of how the final show down will go. And the teaser for the next one gave me all the angsty, excited shivers. So I am giving this book all my squee points, and thus far it has been my reading highlight for the year. Now I am off to reread these compulsively until I get my sweaty hands on the next one. YA/NA, can we ever really escape this genre. It is so ubiquitous and so tempting. Look at that cover, check out that blurb, can you see why I would be tempted? So this is a post-apocalytic dystopian where there are strict class rules and little to no room for upward mobility. Ella, grew up on the lower fringes of the Aristocracy, and is a Natural, meaning that unlike most of the Aristocrats (particularly the Elites) she has not been Altered or Modified-though she does still have a thought modification chip as everyone is her world does. But her father, in one of those rare opportunities for upward mobility, creates a society altering virtual reality game that raises them to the heights of their society. If you note all the random capitalizations, that is as the author intends, as there is an explanation in the initial info-dumping of the story about how they spell things differently now and they use more capitalization. There are a ton of really interesting concepts, it is kind of like we are plopped down into a hyper technical Panem Capital, but instead of the 13 districts we have a virtual wasteland which all but the Aristocrats must scrabble to survive in. And I suspect that if I read more YA/NA I might recognize more of the motifs. It wasn’t that it is a poorly done mashup, the world building is cohesive enough. It is just that some things seem vaguely familiar, as if I have read the blurbs or seen the movie trailers, not enough to make me think of something directly, like I did with the Hunger Games, but just enough to catch my attention. And I think that all these concepts being jammed in were what made it such a slog. Plus, it took about the first quarter of the book to really feel like things were going anywhere and it just about bludgeons you to death on the life lessons of loving yourself and humanity’s penchant for destruction. There’s no subtlety at all. But then we hit the 25% mark and things seem to speed up. I spent a good bit of that section with an uncomfortable lump in the pit of my stomach. Basically what is happening is this: Ella has her Real Life which is unabashedly awful, and Nexis Life which is mostly very good. In Real Life she has basically no one, and in Nexis Life she has friends in the form of the Trickesters and a boy she loves. In Real Life she needs to find out why the bad things are happening (that is very obtuse but I don’t want to spoil it) and in Nexis she is on a quest with her fellow Tricksters. I make it sound prosaic, but it isn’t it is really good and there is quite a bit of emotional growth. And then at around the 50% mark things slow back down to a crawl. There is still a lot of emotional stuff going on, but the story itself seems to revert back to its snail pace and I almost couldn’t force myself through it. Yes we were able to see the relationship between Ella and Gus (her love interest) deepen. But somehow that didn’t seem like enough. And there were some action adventure sequences too, but that didn’t seem enough either. I know the whole thing is only around 300 pages, but it seriously feels like the longest book I have ever read. And then bang, at around the three quarters mark we are back to warp speed and an enormous head trip. Actually several of them, and it was very well done, interesting and exciting. I became excited to see how the book would end and where the series would go. Then the author sets up for a freaking love triangle for the next book and the love interest I like better does something boneheaded too. Honestly I struggled with how to rate this. It was hard for me to finish and there were parts I didn’t like. But there were parts I absolutely enjoyed too. And the entire concept was really interesting, and I genuinely like Ella and Gus, though his absolute enrapture over her is a slightly off-putting and one of those NA tropes I don’t care for. And I will almost certainly read the next one because I am fiendishly curious where this whole thing is going. But you know what? I have a feeling that I will start out a bit miffed when I do start it and I hope the author resolves the whole love triangle thing PDQ. So where does that leave me? Not a stellar rating, but an OK one. And I think this may turn out to be a popular book, probably deservedly so. It is well written, intricate, and has some heft to it. It is just that I am at least a half step out of sync from this book’s primary audience. And if you want another perspective and some more information on the history of this world, check out this blog. This is the 4th and final book in Carriger’s Finishing School Series. So this is in a way a prequel series to the Parasol Protectorate, as timeline wise it is earlier in the same world, just as The Parasol Protectorate is a prequel to the The Custard Protocol series. And if you haven’t read either of those, you can absolutely start with this series even though Parasol Protectorate came out first. Just not with this book. This series needs to be read in order to make sense. But it is a fun, and mannerly steampunk world that I enjoy very much. See? Adorable. I had to have it. And subsequent books deal with Sophronia growing up, as a lady who finishes…everything. I think I was on to something previously when I posited that New Adult really only works well for me when it isn’t contemporary. Plus, the covers are simply gorgeous. But now we are in Sophronia’s final adventure. Lessons in the art of espionage aboard Mademoiselle Geraldine’s floating dirigible have become tedious without Sophronia’s sweet sootie Soap nearby. She would much rather be using her skills to thwart the dastardly Picklemen, yet her concerns about their wicked intentions are ignored, and now she’s not sure whom to trust. What does the brusque werewolf dewan know? On whose side is the ever-stylish vampire Lord Akeldama? 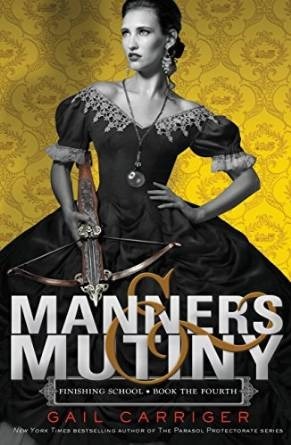 Only one thing is certain: a large-scale plot is under way, and when it comes to fruition, Sophronia must be ready to save her friends, her school, and all of London from disaster—in decidedly dramatic fashion, of course. And I’ll admit to having some trepidation over how everything would be wrapped up. But I was soon sucked back into this world where espionage is the rule, disguises are de rigueur, etiquette is cutting (both figuratively and literally) and where plot-pets are delightfully mechanical. It is oh so bittersweet to find everything finished. 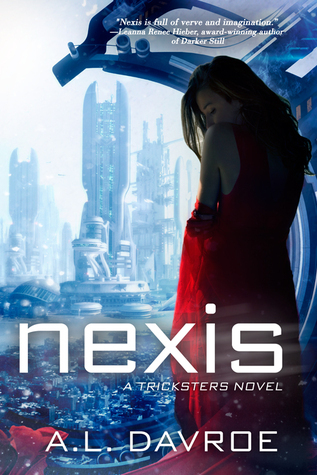 There isn’t much I can relate regarding the plot, besides the the aforementioned general description about the genre mashup and the book blurb, without spoiling either this book or previous ones in the series. So I guess I’ll focus on Sophronia, a lady I enjoy tremendously. She’s intrepid, resourceful, and smart. It has been a delight following her adventures in this madcap steam punk world. I can’t say how much I enjoyed this final adventure focusing on her, and her growth, rather than so much on her feelings for boys. Don’t get me wrong, we get a satisfactory happily ever after, but that wasn’t what this book was about. I wish I could find more steam punk or gas lamp stories like these, Meljean Brook‘s, or Cindy Spencer Pape‘s. So I highly recommend this series for lovers of those genres, whether they like new adult fiction or not. I also recommend it for those who enjoy new adult, so long as they don’t strenuously object to steamp punk/gas lamp. 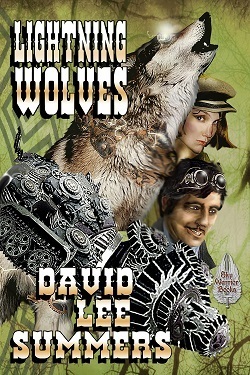 And if you are a new adult fan who wants to dip their toes in steam punk, this is probably the place to start. It is also an appropriate selection for teens, there isn’t a thing a parent would object to, that would simply be unmannerly. And as an aside, one of the things that fascinates me is how very much I now want to go back and reread The Parasol Protectorate and look for all the tiny little linkages. That series is completely unneeded for this series, nor is this one needed for P.P., but for people who are interested in both, the little connections are just so fascinating. It is excellent world building in my opinion. This is the 8th and final book in Cindy Spencer Pape’s Gaslight Chronicles. I got into this series after reading Meljean Brook’s Iron Seas. It was so refreshing and different that I had to find more like it. Somehow in that mindset I missed the “different” aspect of it. Needless to say, I read some abysmal steam-punk, some mediocre stuff, and then I found Gaslight/Gaslamp and this little gem of a series. The series presents a unique spin on Gaslight with the inclusion of a Knights of the Round Table mythology, vampires, werewolves, fey, and steam punk elements. It sounds overly busy, but it isn’t, it is just a wonderfully engaging world and the different aspects are very well blended. The first book in the series, Steam & Sorcery, sets up the world building and the main characters for further books. It may not have hit the peaks that The Iron Seas did, for me, but it was pretty awesome and so I devoured what was available and have kept up with it since. And THIS is the book that I have been waiting for since the beginning. There have been some hints and then some stumbling blocks along the way, but man have I been longing for this book. This is NOT, in my opinion, a stand-alone, and I strongly encourage reading the series in order. Tom was a bit of a tough nut. He did some stupid things in his youth, and rather than trying to resolve things, he basically buried his head in the sand and gave up. And I think that is what hurt Nell the most. Nell on the other hand, despite the heartbreak, she grew into herself and found her agency, learning to value herself and demand respect. Tom took a little longer to get the picture, but I respect that Nell kept to her path and didn’t allow him to sway her. I think you can tell I really liked Nell, and once Tom got his head out of it, I really liked him too. As far as the mystery goes, it was satisfyingly twisty. There was a good bit of sleuthing to be done, and this gave our two main protagonists the chance to really see how they’ve grown, without the blinders of their youthful relationship. But the mystery wasn’t a McGuffin either, it was well thought out and worked for itself AND to further the relationships and emotional connections, rather than just the latter. It kept me engaged so the whole story didn’t feel like over emotional navel gazing. Who says romance can’t also have a real plot, a real story? Not me, that is for sure. There was a bit of wish fulfillment in one element of the story, but I only noticed that retrospectively. And it was such a delightfully happy thing, that I simply could begrudge it. In the end I believed in this couple’s happily ever after and trusted they had the grit to work through anything together. It was a very satisfying happily ever after. I’m still hoping the author comes back to this world and we get Jamie and Piers’ stories, but in the meantime, this was a satisfying conclusion to the series and in no way feels as though the reader has been abandoned in series. 4 stars and I look forward to what Cindy Spencer Pape might come up with next. I received a copy of this book from the author, via Amazon, this does not affect my opinion of this book or the content of my review. Additionally, I do not “know” the author, nor do I have any type of personal relationship with him. This book started off promisingly enough, with a dream about the war. No, not the civil war, a war between the United States and Russia in an alternate history where steam rules and fantastical engineering feats are accomplished, and where a shadowy entity known as The Legion runs amuck in society, politics and war. It turns out this is actually the second story in the series, but overall I’d say the author does a fair job of updating the reader on events so that this can be read as a stand-alone. However, can and should are two very different things. And right after checking in with the main protagonists we start cutting away to other characters who are obviously and pointedly the main protagonists of the first book. I’ll admit, it took me out of the story a bit and I struggled to care a whit for them. Maybe I am a bit too ADHD, but I have trouble focusing on more than a small handful of unknown characters at a time. But, back to the two I consider the main characters in this book. One is Larissa Crimson, a bounty hunter and war hero living under an assumed name. She should have been right up my alley, a wild west feminist interested in science and engineering, Yes, that should have been my catnip. What got in the way of that, is before I even got to know her as she is, we started getting dreams of her childhood. The other is Professor Maravilla. He’s a steam punk mad scientist and a naturalist with a penchant for talking to himself, and he too is living under an assumed name And then a little later we are introduced to the third main character, Sergeant Michael Harris. He’s the one who ties the characters from the previous story back into the current one. As for the story itself, the first part seems like a McGuffin. The professor and Larissa are searching for the answer to a camel carrying a skeleton which is spooking people off from an area. The mystery is eventually solved, but initially the only purpose I could see for it was to give the professor and Larissa a reason to be difficult to find. It turns out that isn’t the case, it was a lesson characters needed to learn. There were several other plot lines that all eventually converged. There was excitement and drama, and of course fantastical steam punk elements.